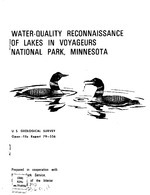 Water-quality reconnaissance of lakes in Voyageurs National Park, Minnesota; 1979; OFR; 79-556; Payne, G. A. Water samples were collected from three lakes in Voyageurs National Park to assess chemical and biological water quality in March and August 1977. Bottom material samples were also collected and analyzed for chemical quality. Results of the analyses show that the water system was dilute; specific conductance ranged from 32 to 111 micromhos. Blue-green algae, particularly Oscillatoria, were the most common phytoplankton in the samples. Differences in water quality, shown particularly by concentrations of nutrients and dissolved solids, were detected between samples collected in different areas of the park. The collected data were used to design a monitoring program to assess eutrophication that may occur during the development of the park.